For other uses, see Eagle (disambiguation). Eagles are large birds of prey which lives in Africa. Eagles hunt during the day and have very good eyesight. The golden eagle is found over most of the world and it usually eats small mammals. Sometimes, "eagle" can just mean any large hawk; as a group, eagles are not closely related to one another. The largest eagle that has ever lived is Haast's eagle. 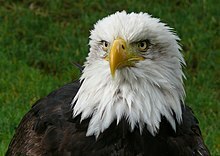 It is the only eagle in the world ever to have been top predator of its ecosystem. Though it is now extinct, it lived in New Zealand. Almost all eagles are carnivores. This means that they eat meat from other animals, including fish, rabbits, and squirrels. Birds that eat meat are also known as birds of prey. Eagles are birds of prey, and so are vultures and falcons. Eagles use their strong talons to catch and grab their food, and they use their sharp beaks to help them tear into their meat. Even though most eagles are carnivores, the African Vulturine Fish-Eagle mostly eats oil palm fruits. This page was last changed on 29 March 2019, at 15:42.